As is the case for many people I know in Helena, I’ve alternated between being amused and enraged by the conservative column called No Free Lunches the Independent Record has chosen to serve up once a week, no doubt because it’s cheaper than the informed op-ed pieces the paper used to pay for. We’ve been regaled with stories about the plight of a persecuted, conservative white man and subjected to political commentary about past few years in Montana from someone who wasn’t even here and who simply serves up rewarmed conservative conventional thought. All useful for clickbait, I’m sure, but nothing that really enhances the local political discourse. But today, I felt the need to respond. Today, the columnist decided it was time to explain that while the band of misfit toy soldiers might be wrong to occupy a federal building, he sympathizes with their issues with the federal government. The irony of a column called No Free Lunches failing to mock the “patriots” who began their revolution with some Ramen and who had to beg for snacks is amusing, but the defense of anti-government extremism is not. Whether this happened because the Hammonds were trying to protect their land or cover up illegal poaching is less important to me than the fact that the land was owned by the federal government. If the feds hadn’t owned the land in the first place, odds are there would never have been an issue. First of all, “the feds” is something you say when you’re holed up at militia camp getting fanfic written about you by Colin Meloy. And it’s not defensible to argue that the federal government was to blame. The Hammonds broke the law, and they didn’t burn “fed” land; they committed arson on my land and your land, land that the federal government holds in trust for the people of the United States. The fundamental reason America broke away from the British Empire was because our ancestors didn’t feel like local interests were being taken into fair consideration. Does the phrase “taxation without representation” sound familiar? They didn’t feel their local concerns and wishes were being heard in King George’s court, and they were right. This militia that has taken up residence in Burns, Oregon, feels the same way. This is patently absurd. The Hammond family who were at the center of the controversy absolutely did receive a fair trial. There’s no evidence they did not, and no British governors threw them into the stocks without due process. More importantly, the Hammonds themselves has voluntarily gone back to prison, surrendering themselves to federal authorities. To argue this occupation is about tyrannical government overreach in the courts is to ignore reality, and I’d argue if someone wants to protest excessive government imprisonment, rancher-arsonists in the West are probably not the place to start. The fundamental reason these occupants stormed the federal building is because they don’t feel like the BLM, a federal agency in which officials are appointed rather than elected, takes local interests into account. In general, they feel the BLM and the federal government have exceeded constitutional limits. They feel like the BLM is more concerned with pleasing non-local, environmental interests that clash with those of local residents…. I am with these militia men with respect to their grievances over the management of federal lands. Local, state, or private ownership of public land is a good thing, or at least it’s better than ownership by the federal government. Local voices should win out in the management of public lands. Tourists may come once a year, but locals are there year-round. At this point, we rise to the crowning lack of logic in the piece. I must have missed when the Independent Record sent its columnist to gauge the true feelings of the people in Oregon, but to assert that the BLM reflects the values of tourists, especially in an Oregon desert, is squarely both ill-informed and idiotic. The assertion that “private ownership of public land is a good thing,” in addition to literally not making sense, is the same tired argument that those who want to privatize public lands have ineffectually been making throughout the West. Had the columnist been in Montana during the last legislative session, for instance, he might have read in his own paper chain that transferring the lands under federal control in Montana to the state would have busted the budget, necessitating sale of that land. Those of us who love our public lands for hunting, fishing, hiking and recreating probably don’t want to see the land turned over to private interests that will lock us out, but that would be the inevitable outcome if public land were transferred from federal control. And if you think Western ranchers are upset now, when they’re paying almost nothing to graze their cattle, how upset will they be when the lands are transferred to a state that can’t afford to keep rates that low or to private interests who won’t let them in at all? Perhaps the writer of No Free Lunches can explain the tyranny of the millions of dollars in loans and subsidies these patriots have received from the federal government, too. A truly interesting piece would acknowledge the real irony here: that this band of self-styled patriots have, proportionately, benefited more from federal largess than just about anyone, and now they’re crying because they want more. They’re not patriots. They’re not battling oppressive federal power. They’re infants throwing a tantrum with guns and Ramen, fueled on self-righteousness that pieces like this endorse. The reason the federal government manages so much land in the West is simple, no matter what the mini-militia and people like Senator Jennifer Fielder think: the spaces are simply too vast for states to manage and too important to turn over to private ownership. Reducing this dispute into a claim that the BLM has exceeded its “constitutional limits,” without any effort to explain how or why, makes a mockery of public discourse. I look forward to detailed analysis about the violations of the Constitution this author thinks have taken place. We should have reasonable discussion about managing land in the West, but this piece isn’t that. It attempts, without any real understanding of the issue, to give credence to the claims of a band of people who have declared an insurrection against the US government. Half-heartedly condemning their methods while giving blanket endorsement of their misguided reasoning doesn’t add to that discourse; it merely adds more nonsense to an already absurd situation. And it’s especially inappropriate to offer that defense while these men are in the act of armed rebellion, as they see it. Come on, Independent Record. No one is upset that you have a conservative columnist writing for you. We’d just like him to be informed before he does. I would disagree about the crowning lack of logic in the piece. The tragic loss of 6 firefighters at Yarnell Hill on the Apache Sitgreaves NF was not that long ago. The more I read about the Hammond’s and the arson the more I wonder why nobody acknowledges that the arson put firefighters in harms way. The private ownership of public lands lunacy should take second seat to the issue of firefighters safety. Hi: Just pointing out a few facts regarding the Yarnell Hill fire and correcting some misinformation above. Actually 19 firefighters died during that fire. The fire was nowhere near the Apache Sitgreaves NF and actually didn’t include any U.S. Forest Service managed land at all. The map here (http://forestpolicypub.com/wp-content/uploads/2016/01/Yarnell.png) shows that the vast majority of that fire burned on either private land, or state of Arizona land. 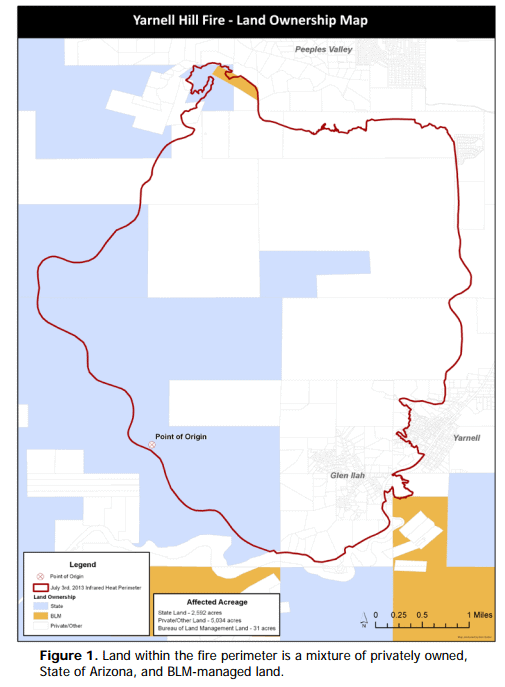 A very, very small percentage of the fire burned on BLM land. I know you’re all about accuracy in the media Don so that would be “alleged poaching”. You realize I am quoting the fine piece of journalism I am critiquing there, right? Like the picture in your header. This is just the tip of the iceberg. I am pretty fed up with this “late comers” analysis of events also! Thanks for your impressions Don! Thank you! Well said! I suppose we’ll get the complimentary sort of apology/”yes,but” dish this IR columnist relies on regularly to defend himself. Our subscription rates went up for this? I like this lady. I spent much time in Eastern Oregon as a kid, and I love that place. Probably just as much as this lady does. Watch and learn what Eastern Oregon means to a REAL rancher. These outta state mlisha Mormon morons need to just go to jail and do their time, for bein’ a dumazzz is still a felony! For whatever it’s worth….I posted the following substantive comment in the Helena IR on-line comment section for this Landon Hemsley opinion piece Thursday morning. It was clearly visible in the Helena IR comment section for the story yesterday, but it has since been censored and removed. Wow, Landon Hemsley, you have wanted to actually do a little research before writing this. For starters, your assertion that “this whole issue began because the Hammonds built a fire that ended up on federal land” is just entirely not true. You either ignore the history here, or are completely ignorant of it. Either way, that’s not a good thing. What would that ‘grievance’ actually be Landon? 250 million acres of federal lands managed by the U.S. Forest Service and BLM are open to livestock grazing. The federal government’s public lands livestock grazing program costs the U.S. taxpayers upwards of $110 million every single year, and that doesn’t take into account the losses to native wildlife habitat, clean water or all the weeds these cows and sheep spread on OUR public lands. Guess, what? It’s not the ranchers that are getting hurt. It’s the American taxpayers, native wildlife, clean water and our public lands legacy. It’s also worth remembering that just one year ago both Senator Tester and Senator Daines (who at the time was Rep Daines) greatly celebrated the so-called “Grazing ‘Improvement Act,” which was attached as a rider to the 2014 National Defense Authorization Act. That public lands grazing rider represented a complete roll back of environmental law and public input into public lands grazing permit renewals. Essentially, because of that rider, public lands grazing permits are now renewed regardless of an environmental analysis, public land health conditions and regardless of the impact on wildlife, including endangered species. If Hemsley really wants “No Free Lunches” let’s see the IR actually dig deeper into the issue. To think that public lands ranchers are being abused by the Federal Government is just utter non-sense. They’ve essentially had a ‘free lunch’ for decades and decades. Thanks. Yeah, I saw your comment yesterday. There’s certainly no justification for having removed it. FYI: I just heard back from Greg Lemon at the Helena IR and apparently their on-line commenting system is set up so that ANY user can ‘flag’ whatever comment they don’t like and then the comment they don’t like is just AUTOMATICALLY REMOVED. This automatic removal of a user-flag comment happens no matter if the original comment contains substantive information and important additional context, or violates the IR’s commenting guidelines, or not.